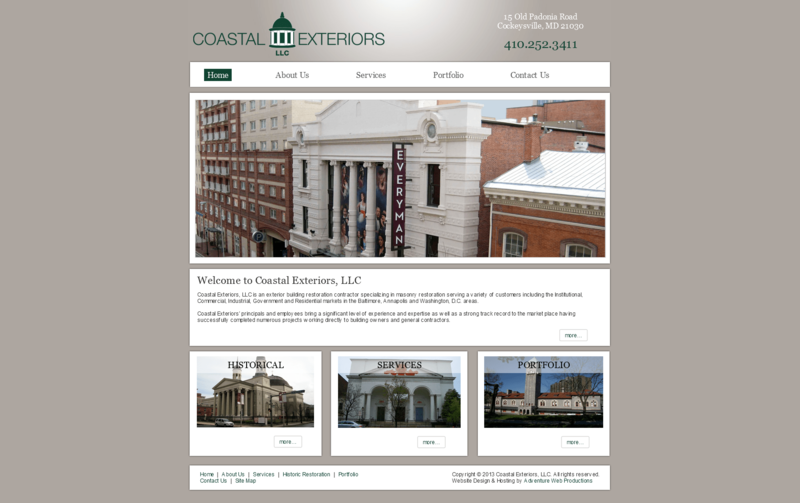 Coastal Exteriors, LLC specializes in facade restoration of historic buildings. They have restored many buildings in Washington DC and the surrounding areas and are continuing in that tradition to keep the Baltimore/Washington area beautiful and help to maintain the historical integrity of many of the buildings. Some of their clients include The Lyric Opera House, The Basilica of the Assumption, and the Washington Navy Yard, just to name a few. Coastal Exteriors focuses specifically on making sure that any restorations they do adhere strictly to the codes that are put in place for historic buildings. All the materials, restoration methods, and techniques that they use have helped them make strong connections in the area. Their reputation is unparalleled in the restoration field of Baltimore and DC. Not only does Coastal Exteriors specialize in restoration, but they also offer other services. Some of these include facade cleaning, brick and stone re-pointing, exterior building repair, professional painting, and restoration of various surfaces. They also check for underlying causes of deterioration whenever they are on a restoration project to give clients the assurance that the restoration will last for an extended period of time. While it can sometimes just be age that causes a facade to deteriorate, leaks and other maintenance issues can also cause it.